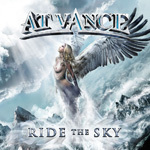 With Ride The Sky, At Vance builds upon the great strides made on 2007's VII delivering once more full throttle melodic metal oft dipped in solid power metal. However, after several spins I wonder if At Vance is not also turning towards more melodic hard rock. Songs like Ride The Sky, Torn, and Wishing Well could easily pass for this style if not for the fine metal edge coursing within. In the end, distinguishing such nuances are meaningless as At Vance has always erred (for the good) on the side of a strong melody, harmonious vocal arrangements, and a catchy chorus. Couple these with strong riffs, Olaf Lenk's sizzling fret work, and an enduring and uncompromising rhythm section and Ride The Sky becomes a tour-de-force of pure European melodic metal. Even when Lenk revisits his classical heritage pulling off Vivaldi without compromise, it all makes such perfect sense in context. Other notable bursts of melodic enthusiasm come on Wishing Well, You and I, End of Days, and the glorious Falling. At Vance's eighth release, Ride The Sky, Olaf Lenk and company not merely finding their stride, but over taking past accomplishments. Ride The Sky is infectious melodic heavy metal at it's best. Recommended! At Vance's eighth release, Ride The Sky, Olaf Lenk and company not merely finding their stride, but over taking past accomplishments. Ride The Sky is infectious melodic heavy metal at it's best.